Tali Shapiro – A Music Fan or a Hatred Fan? Tali Shapiro presents herself as a long-time music fan painfully calling for her favorite bands to boycott Israel- But is she? BDS activist Tali Shapiro has a new target – the Red Hot Chilly Peppers band, which announced a much anticipated concert in Israel this summer. But Shapiro does not adress the subject honestly’ as an activist with a very clear and agressive agenda (legitimate as such), but first of all as a fan. Why is it then she’s not even the fan band’s fan ON FACEBOOK untill it’s time to call for divestment? A quick browse through her profile shows that she almost only likes Bands and artists who announced a concert in Israel,soon after the announcement, in order to fill their public pages with calls for boycott. This is a partial list of the artists Shapiro connected to on facebook in the last 3 months – All of them shortly after an announcement of a show in Israel was made. So, are you a Red Hot Chilly Peppers fan since childhood – that is, last month? just the way you’re a Cassandra Wilson, Cat Power, Madonna, Afrojack and James Blake (All announced Israel concerts in 2012- some cancelled)? I suggest you Message her personal profile and ask! I’m not saying don’t be political – I am saying, be honest and don’t lie about yourself in order to establish empathy or whatever! 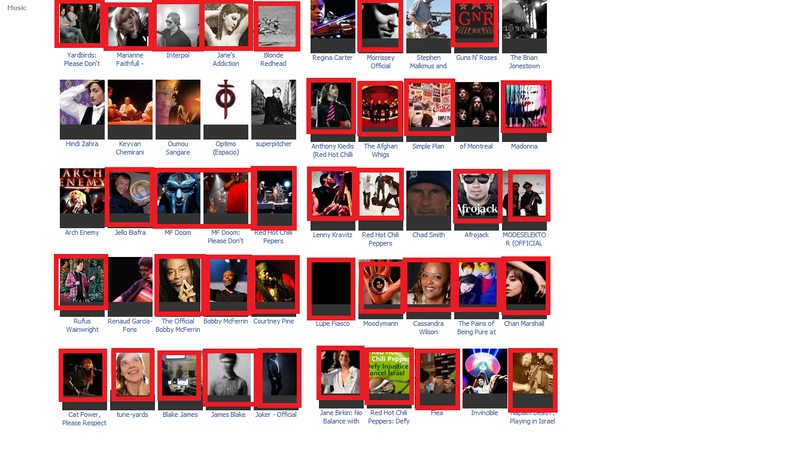 From the facebook profile page of Shapiro, Marked in red are artists Shapiro liked, who “happened” to announce concerts in Israel just in the last couple of months- At least 37 out of 50 Artists are ones that announced concerts in Israel!